Abundance (atom fraction) of the chemical elements in Earth's upper continental crust as a function of atomic number. 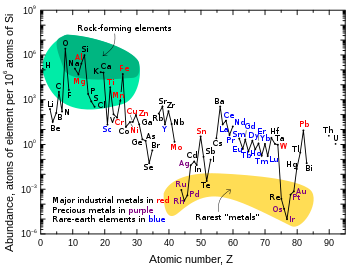 The rarest elements in the crust (shown in yellow) are not the heaviest, but are rather the siderophile (iron-loving) elements in the Goldschmidt classification of elements. These have been depleted by being relocated deeper into the Earth's core. Their abundance in meteoroid materials is relatively higher. Additionally, tellurium and selenium have been depleted from the crust due to formation of volatile hydrides. ^ Goldschmidt, Victor (17 March 1937). "The principles of distribution of chemical elements in minerals and rocks. The seventh Hugo Müller Lecture, delivered before the Chemical Society". Journal of the Chemical Society: 655–673. doi:10.1039/JR9370000655. ^ a b Siderophile element constraints on the origin of the Moon, 2014, Richard J. Walker, Philosophical Transactions of the Royal Society A, accessed 1 December 2015. ^ Ball, Philip. "Earth scientists iron out their differences". Nature. Macmillan Publishers Limited. Retrieved 5 June 2017. ^ Ramanathan, AL. ; Bhattacharya, Prosun; Dittmar, Thorsten; Prasad, B.; Neupane, B. (2010). Management and Sustainable Development of Coastal Zone Environments. Springer Science & Business Media. p. 166. ISBN 9789048130689. Retrieved 5 June 2017. ^ Allaby, M. (2013). A dictionary of geology and earth sciences. Oxford University Press.